Is There a Future for Small Farmer Organizations? | Small Farmers. Big Change. Is There a Future for Small Farmer Organizations? Last week a few of us from Equal Exchange traveled to El Salvador to attend the CLAC’s First International Gathering of the Small Producers’ Symbol (SPP), an historic event which marks the first Fair Trade initiative developed by small farmer organizations. As opposed to the FLO International Fair Trade system, which was designed in the North to support small farmer organizations in the South, the SPP was created and developed by farmers’ organizations in the South and will be implemented by Alternative Trade Organizations in the North. For two days, representatives of small farmer organizations throughout Latin America and the Caribbean and their closest industry allies in Europe, Canada, and the United States, gathered together at a beautiful retreat center outside San Salvador, at the top of the San Salvador Volcano to learn, debate, and share ideas concerning the best ways to launch the new symbol. It was exciting; and incredibly inspiring to have the opportunity to participate in this gathering and help shape the initiative so that it can have the strongest chances of success and impact in the market. We will be sharing much more about the Small Farmer Symbol in the coming months, and soon we hope you will start to see the symbol on small farmer products in grocery stores throughout the United States (and elsewhere). Why is the CLAC ( The Latin American and Caribbean Network of Small Fair Trade Producers) developing a small farmer symbol? 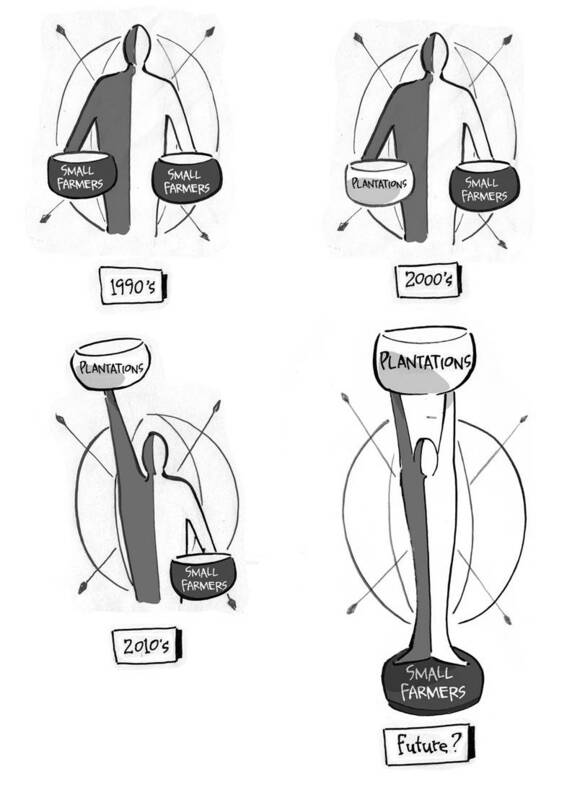 Once it became clear that the FLO system was moving away from its original mission: to provide market access to small farmers and to change the way international trade is conducted (by leveling the playing field between small farmers and plantations), small farmer organizations realized that they would need to create their own ways to survive and thrive in the international arena. Ironically, just as the CLAC launched their own symbol to differentiate their products in the marketplace (and within the Fair Trade system itself), TransFair USA (now FairTrade USA) announced their new initiative, Fair Trade For All. Although TransFair’s press release never explicitly states so, the organization has made it clear elsewhere that they are now fully ready and willing to allow plantations growing coffee, cocoa, and sugar to receive Fair Trade certifications. In doing so, their goal is to continue growing the system fast, far, and wide. When small farmer organizations (ATOs, Fair Trade organizations, and FLO International itself) protested, TransFair USA responded by withdrawing from the international Fair Trade system to go it alone. We don’t yet know what the future will hold. Will plantation coffee, cocoa, and sugar (along with all the other plantation products already certified by TransFair USA and FLO International) signify the end of these small farmer products and therefore the end of small farmer organizations? Will they be able to compete against all the competitive advantages that plantations have been allotted through the past centuries? While we can’t predict the future, the threat is real and it is safe to assume that life just became increasingly more difficult for small farmer organizations. It is sad; even with a small farmer Fair Trade system, the past twenty-five years have not been easy and so many hundreds of small farmer organizations, ATOS, and other Fair Trade advocates have worked hard to build small farmer supply chains, and to educate consumers about the issues and challenges involved in trying to structurally change an inherently unfair trade system. Will all this hard work have been in vain? Do Small Farmer Organizations have a future? Well, as all social justice activists know, no one ever said changing the world was easy. Thanks again to all of you for your support and willingness to question, learn, and ACT. We will continue to stand by and for small farmer organizations and an alternative trade system. As with any topic, we encourage everyone to do their homework. If you visit http://www.FairTradeforAll.com, you can learn about Fair Trade USA’s robust strategy to double the impact of Fair Trade by 2015. It’s a bit too easy to toss around terms like “plantations” to incite fear in change and to overshadow the millions of Farm Workers who could and should benefit from Fair Trade. We do recognize concerns from coops about additional compeititon. The fact is that no industry partner has expressed any interest in moving away from cooperative coffee, but rather making their current supply more just for the workers who produce it. It’s also key to recognize that Fair Trade supports a variety of farming situations in other product categories today, not just cooperatives. Again, I encourage everyone to become educated. Please consider the opportunities to support Fair Trade for All so that no one is left behind in farming communities where cooperative members and farm workers live side by side. Thank you for your comments. I must respectfully disagree. No one is denying the urgent need to support the rights of farm workers who are exploited on plantations around the world. Nothing, however, in TransFair’s track record demonstrates that they provide the solution to this issue. It is tempting to try and sweep many issues under one umbrella which has gained traction in the market (through all of our hard work) and call it Fair Trade. Our concern is that once you flood the market with abundant quantities of plantation coffee, you will not only fail to create meaningful change for farm workers, but will also completely undermine small farmer co-operatives. Corporations will have a sealed product, but the opportunity for deep and profound necessary change will be lost. The Fair Trade movement is about democracy, transparency, and integrity. This requires more than simply accepting the current system of trade which favors large corporations and plantations at the expense of small farmers. Fair Trade was built through the blood and sweat of thousands of small farmers and their allies in the North. These organizations have consistently, repeatedly, and unequivocably stated their position that there is still far to go in order to provide market access to more small farmers, strengthen their organizations, build more democratic institutions, educate consumers, and most importantly transform the trade system. Our work is not yet done. To ignore the voices of those organizations – producer and ATO – who tirelessly built the system, and especially the small farmers for whom it was built, by unilaterally courting plantations and corporations and then weakening the standards to allow for easier entry, is neither democratic nor instills confidence in this new strategy. 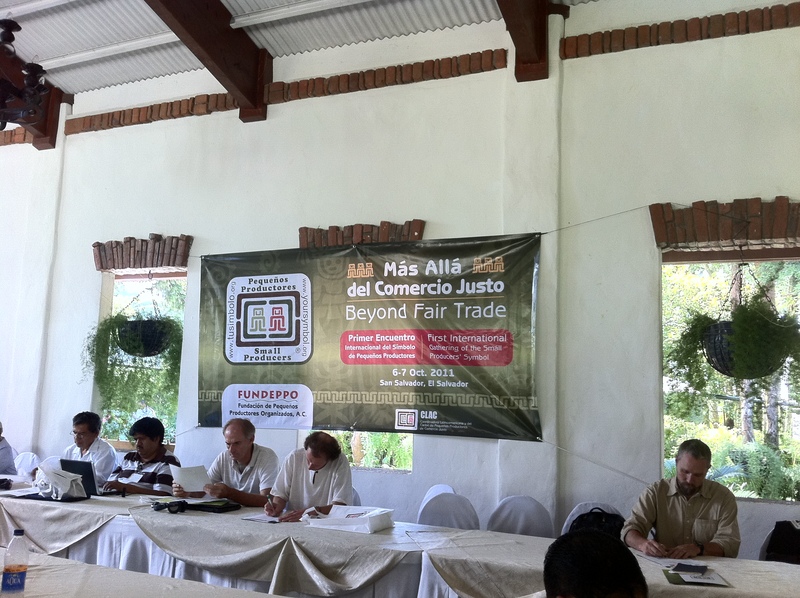 Finally, at the First International Gathering of the Small Producer Symbol in El Salvador last week, the Latin American and Caribbean Network of Small Fair Trade Producers (representing 250,000 small farmers) repeated their disapproval of TransFair USA’s “Fair Trade for All” strategy. They publicly announced that they are not accepting funds for the Coop Links program. It is no easy decision for small farmer organizations to decline funds for badly needed quality trainings, infrastructure improvements, and access to credit; but they felt the need to do so. Surely, a stronger statement cannot be made. While opening coffee, cocoa, etc. to plantations to keep farm workers from being “left behind” surely can’t be taken as a serious argument, I’m having trouble understanding EE’s position on this. That you don’t think plantations belong in Fair Trade is clear enough, but EE already uses IMO’s Fair for Life certification for some of its products, and Fair for Life has no restrictions against plantations (that EE wouldn’t source from them notwithstanding). True, Fairtrade International’s (FLO) standards exclude plantations from coffee, cocoa, sugar, cotton, etc., but FTUSA has gone its own way and isn’t bound by FLO policies anymore. So why is it calamitous for Fair Trade when FTUSA announces its intention to certify coffee plantations but not when others do? To be clear, we don’t support opening up Fairtrade (FLO) standards to plantations on products that have been restricted to small farmer coops. The Producer Network members (like CLAC) have been clear in their opposition to it and we haven’t heard a compelling argument for it. But that’s our position, and others clearly see things differently. Why is it so hard to understand Equal Exchange’s position on TransFair USA unilaterally opening up coffee, cocoa, sugar, etc. to plantation products, breaking its word to farmer organizations and ATO’s that they would not do this, changing their name to FairTrade USA (implying that they ARE Fair Trade) and then weakening the standards so as to lower the “barriers” for corporations to market their products “Fair Trade”? We do believe TransFair’s strategy is calamitous and we choose to stand alongside our small farmer partners and say so. If you believe firmly as we do, that by aggressively courting plantations into the Fair Trade system, the certifier will give corporations and plantation owners an unnecessary competitive advantage (unnecessary because they already have one), will create little impact for farm workers, and all the while, will negate 25 years of hard work to provide market access for democratically organized small farmers, would you remain silent? I hope your conscience would move you to speak out. Many stakeholders have repeatedly asked FLO International and TransFair USA to conduct impact studies on currently certified plantations to demonstrate that improved conditions and real change have occurred as a result. Those studies have never yet been presented, nor to my knowledge, have they ever been commissioned. In other words, there is no proof that a plantation model is working in the current FLO system for those products (such as tea and bananas) that have been allowed certification (over small farmer protest). Why would we believe that allowing plantations into a small farmer Fair Trade system would have any impact on coffee, cocoa, sugar or cotton plantations? Sometimes it’s good policy to have carrots and sticks: a carrot to help provide market access for small farmers and a stick to ensure that plantation owners are treating their workers well. We believe in labor rights, worker empowerment, unions, and improved working conditions for farm workers. We just don’t think that Fair Trade is the model within which to guarantee these things. Finally, you are right that IMO provides a certification system for those small farmer organizations and plantations that already exist within the Fair Trade system. There is a big difference however, between a certifier passively certifying what already exists within a system and a certifier who actively courts, promotes, and lowers standards to aggressively promote one market sector over another. Unlike IMO, which has never claimed to be or do anything other than certify, FLO International and TransFair USA were created to represent the democratic aspirations of the Fair Trade Movement and that is why their actions represent such a strong betrayal of our values and principles. I hope this clarifies our position. Again, Fairtrade Canada’s not in favour of opening up to plantations, and neither am I personally for that matter. Also, it’s very clear that EE’s not in favour of plantations being anywhere near fair trade, and that position is both abundantly clear and long-standing. None of that’s in question. But it’s still not clear to me why, from EE’s perspective, FTUSA’s plans are so significant given it’s not the first FT certifier open to coffee, cocoa, and sugar plantations. Surely, whether or not to seek certification is a business decision for most companies (including plantations). So whether or not a certifier openly courts them is relevant only to the extent that it *may* lead to more than might have occurred with a more passive approach. But the door is open regardless of how passive or active the approach – if a plantation wanted certification, it could already get it before FTUSA’s announcement. So with Fair Trade certification of coffee, cocoa, and sugar plantations already being possible, is the main concern with FTUSA that they’ll be more successful with it commercially than a more passive certifier like IMO? I can’t speak to the other issues, particularly those related to breaking faith with the Fair Trade movement, producers, etc. because they aren’t questions for me. However, I think it’s reasonable to point out that, while imperfect, the global Fairtrade (FLO) system has been making significant strides in all of the areas you flag. This week’s announcement of the unanimous decision making Producer Networks 50% owners of Fairtrade International is a perfect example of this (http://bit.ly/r7sFye). So too is the fact that they’ve been the second most represented group on the Board and heavily represented on important committees (like Standards) for years, plus the very real and extensive consultations that have been done lately on standards that go much broader than the Producer Networks. Specific to why plantations are already in the Fairtrade (FLO) system in specific products, the reason is partly historical and partly because some believe there’s a real need for fair trade there. It’s not a position that I personally share so I won’t make the case for them here. However, worth noting is “producers” don’t unanimously oppose plantations in fair trade (though the CLAC has been consistently against it) and, for what it’s worth, there is significant work being done to evaluate and improve upon hired labour standards (http://bit.ly/oYhRCa). But going back to the question, could you explain exactly why FTUSA deciding to open coffee, cocoa, and sugar to plantations, a position they’ve openly expressed in the past and is something already possible through other certifiers, is calamitous for fair trade rather than just being wrong-headed? After all, those who want to make sure they aren’t buying coffee, cocoa, and sugar produced on plantations only need to (a) buy/sell products certified within the Fairtrade (FLO) system, (b) choose companies like EE who are clearly against it and have enough control over their supply to keep plantation products out, and/or (c) choose products marked with the TuSimbolo logo where available. Our money’s riding on the Small Producers’ Symbol. We have to let this dark horse run, and bet the house on it. 30 years on, after millions of people, both producers and consumers, have helped us to arrive at this crossroads, the new road is clear. Of course it’s risky, but it’s a no-brainer, a more-than-welcome, long-time-coming and overdue event. Enjoy! And we want to market it and develop it and celebrate it with poetry, highlighting all of its promise for economic and social justice, as well as its common sense. Don’t underestimate poetry. The rest is noise.